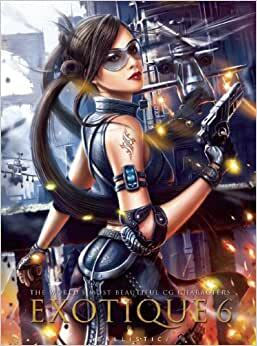 The sixth book in the EXOTIQUE series showcases the world's most beautiful CG characters created for film, television, games, and personal endeavor. Ballistic Publishing books are renowned worldwide for their outstanding quality, and every image in EXOTIQUE 6 is individually color-corrected to ensure that the transfer from the computer monitor to print is the best possible. With inspirational artwork covering the genres of fantasy, sci-fi, anime, and photorealism, EXOTIQUE 6 showcases a wide variety of styles and offers a cross-section of the exciting digital character work being created in all corners of the world. 5.0 颗星，最多 5 颗星Exotique indeed. A very good assortment of artists and art. Great for inspiration. There are numerous different styles and techniques used by the different artist that give great inspiration. More great artwork from around the world using various styles but all to world class quality. 5.0 颗星，最多 5 颗星Perfect Match! Just what I need for to inspire my mind and my art. I have been collecting these books for a few years and I just love to see all the original artwork from the other countries. Very cool book and excellent price here on Amazon! 5.0 颗星，最多 5 颗星Outstanding Artwork !! !